In Wintix, go to File | Ticket delivery methods. In the screen that appears, click on the ticket delivery method you want your patrons to have or unclick those you don’t wish to offer. Your Webtix patrons will only see the ticket delivery methods you have entered in Wintix. NOTE: You can also add or delete ticket delivery methods from this screen. NOTE: The dollar amounts per specific delivery method apply only to Webtix online sales. NOTE: If you allow your patrons to print tickets at home, you need to decide if you want Wintix to Mark tix as printed when emailed (Seventh column.) If you don’t, Wintix will not count them as printed. 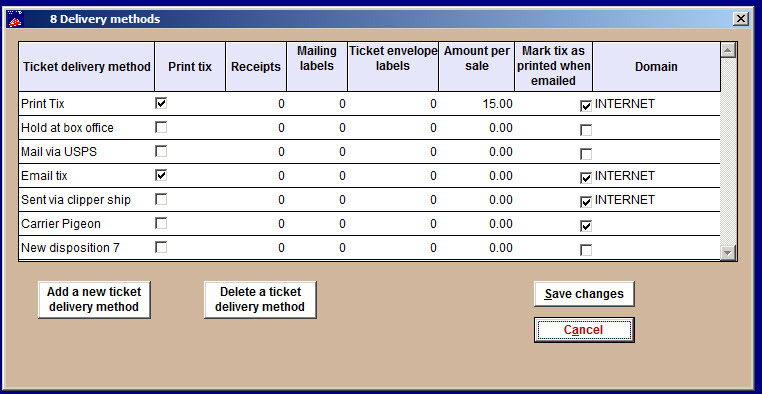 To learn how to set up ticket delivery methods for in-house sales through Wintix, click here. To learn how to change ticket delivery methods for a single performance, click here. This entry was posted in Desktop Software, Printers/Tickets, Tickets, Webtix Full License, Webtix Online Ticketing, Webtix Rental, Webtix5, Wintix5 and tagged tutorial. Bookmark the permalink.